I attempted to bake a "proper" layer cake that is fully frosted and decorated with fresh cream today. Although I know that piping with whipped cream is not as easy as buttercream, I went ahead with my little project as I find buttercream too sweet to my liking. Little did I know that my project turned out to be such a tedious task! I started off making the sponge cake using a recipe from a Chinese cookbook. The recipe is slightly different from the usual ones that I have came across. It uses quite a large amount of sugar (1 cup), salad oil instead of the usual butter, with the addition of fresh milk and some salt. As my intention was to make a strawberry layer cake, I thought it was ok for the sponge cake to be on the sweet side, as the strawberries that I bought were a little too tart. I was hoping the recipe would give a moist sponge unlike those genoise which tend to be dry. All went well until the cake was in the oven for 20mins. The cake top started to brown quickly, likely due to the high sugar content. The baking time is supposed to be around 35mins as stated in the recipe. After another 5 mins, coupled with the cake top "going-to-turn-black" and a slight burning smell, I made the decision to change the cake to a lower-rack position. When the recommended baking time was up, the cake was still not ready. It wobbled when I gave the cake pan a slight jerk. As such I let it baked...and baked...and baked! The cake was only done after it was in the oven for more than 55mins! I didn't know what went wrong, but I think having closed and opened the oven too many times to check, lowered the temperature too much. I had to slice off the slightly burnt top before frosting it. I engaged my little assistants to help me assemble the cake. 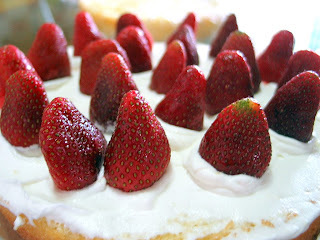 They took turn to fill the cake with whipped cream and lined the layer with circles of strawberries. I arranged the strawberries vertically, thinking that the effect would be great on the cake slice. 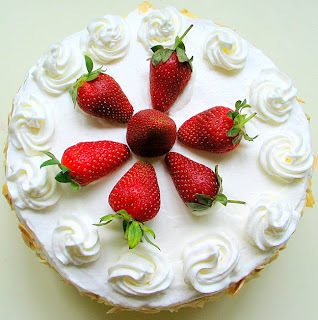 But with this arrangement, it was not easy to fill up the strawberry layer with the cream. I poured and filled the cream haphazardly and top it with the other cake layer...keeping my fingers crossed that the cake would be ok. My elder boy was eager to frost the exterior and so I let him have a go. Eventually I got to shoo them off as they were merrily "scraping" away the crumbs instead of frosting the cake! I proceed to cover the sides with toasted almond silvers. I didn't know it would be such a challenging affair...I had to tilt the cake a little with one hand, and cover the sides with the almond silvers with the other...and all the while taking great care not to drop the entire cake. Sift cake flour, set aside. Grease and line a 20cm round pan, set aside. Pre-heat oven to 180degC. Position rack at the lower bottom of the oven. With an electric mixer, whisk eggs and sugar & salt on HIGH speed for about 5 to 7mins, until the batter double in volume and is ribbon-like (the batter should leave a ribbon-like texture when the beater is lifted up). Turn to LOW speed and whisk for another 1 to 2 mins. Whisking at low speed helps to stabilise the air bubbles in the batter. Add sifted cake flour into the batter. With a spatula, gently fold in the flour until well blended. With a spatula, mix about 1/3 of the batter with the salad oil in a separate bowl. Fold in this mixture into the remaining batter. This method will help to ensure the oil will be fully blended and at the same time will not deflate the batter. Add in fresh milk and fold in gently with spatula. Pour the batter into the pan and bake for 35 mins, or until a skewer inserted in the centre comes out clean. Unmold and cool completely. With an electric mixer, whip the whipping cream still stiff. Slice the cake horizontally into 2 layers. Place one of the cake layers cut-side down on a cake plate. Spread the whipped cream over the layer. Arrange rings of strawberries to cover the whole layer. Fill with some more whipped cream. Top with the other cake layer, cut-side up. Spread the whipped cream over the top and side of the cake. Decorate as desired. Your cake is lovely! Even my eldest son who was beside me when I was browsing your flickr photos commented that it was beautiful:P Don't worry about the pipings, your not the only one who's having a hard time with it (me too!) but personally I prefer the taste of whip cream better than buttercream. Great job! Hi Anne and Gelo, your kind words really make my day! I certainly feel much more confident now :) Yes, fresh cream is definetly better in taste than buttercream. I truely enjoy the process of making the entire cake...I'm sure you know the kind of feeling when you are making yours! Hey ... your cake look good and like the rest said - perfect! It's definitely a good try! I dare not try frosting a cake like that yet. May I ask for the fresh cream, did you use whipped cream and just whip them up till stiff? I used fresh cream and whip them till stiff. However, I wasn't too sure about the consistency...how stiff the cream should be, and I didn't dare to overbeat the cream as advised by many cookbooks. This time I tried non-dairy type as I found the dairy kind too creamy. The brand I used is avoset available from cold storage. It took me several months before I tried frosting a cake. You should try it too! It will really be a good experience. Hi Mariya, thanks for popping by! I will try to whip the cream to a stiffer consistency in my next attempt. Hi Happy homebaker, thanks! am going to try it one day! I'm still waiting to try out the Pandan Kaya Cake first. Hi Elyn, are you refering to the Pandan Chiffon cake...those baked with a tube pan? I have not ventured into chiffon cake yet, as I know it can be quite tricky to beat the egg whites. Oh no not that. It's the actually sponge cake but with the kaya pour over, a famous type of cake sold at Bengawan Solo. I think that cake looks amazing! Well worth the effort! Hi happy homebaker, your strawberry cake is pretty. Well done. I have NEVER succeed in sponge cake using whole egg method. The batter deplete when flour is added in. When oil is added in, it deplete further. I've read that in order not to deflate the batter, you will need to sieve the flour at least 3 times. Usually I will sieve only once, and then when I'm about to add the flour, I will sieve it over the batter. Add in the flour in about 3 additions. With each addition, stir very lightly with a spatula...do this by a "cutting/slicing" method...if you are interested you can take a look at the video clip demo on a chocolate genoise cake by Julia Child and Alice Medrich. It's a good demo on the folding technique. What a wonderful cake! Thanks for the tips on sponge cake making! I was inspired by the Julia Child / Alice Medrich-video a year ago. It is really helpful. I used this recipe yesterday to make my dad's birthday cake (reducing the amount to half as you suggested). I don't know why, but my cake didn't end up as white/golden as yours; mine was more.. hazelnut sponge cake-coloured. The only extra thing I added was some vanilla extract, but that shouldn't have caused the discolouration. Could it be from the hazelnut oil? I used half canola, half hazelnut oil. :S Also, the texture of mine wasn't as fluffy as that of your strawberry swiss roll; in fact, it tasted a bit on the dry side - but that might have been coz I overbaked it, coz I set the timer to the recommended baking time, and didn't check on the cake before this time. As expected, it didn't stay soft after spending a night in the fridge - is it meant to? :( My cream just wouldn't stay on the cake and I do know that partially it was due to that my cake wasn't entirely cooled. So demoralised but looking at ur post just cheers me up! Thank you! Hi Sandy, I hopped over to see the birthday you baked for your child...it is excellent especially for a first timer! This sponge cake recipe is certainly a good start for beginners like us :) I am looking forward to seeing you more often! :D thank you mommy for your nice comment! really appreciate it..
but i'm wondering how do you keep your frosting so white. mine was kinda mixed with the cake crumbs. How do you keep the crumbs down? I am so thankful that my sis found this website of yours and shared it with me. I truly find the joy of baking a cake after several attempt to bake a proper cake but failed. This is good esp no butter is being used! haha... I am not too good in cleaning utensils that so oily after using butter. loved your site. i'm been trying to bake a perfect sponge cake but always ended up with a failed one. your tips are great, i shall try your recipe. however, can you enlighten on what is salad oil? can i substitute with corn oil? Hi Happy Homebaker, your cakes look lovely! The pictures show soft fluffy textures in your sponge! I tried your method of beating the eggs together, instead of sepearting egg yolk and whites (which i usually do), but im not sure what went wrong as when i opened my oven, the cake was sunken, and the sponge didnt look fluffy. What is the difference between beating eggs together and beating them seperately, as most light sponge makers suggest beating the yolks and whites seperately? Hi Calisiacia, I think maybe the different methods yield slightly different texture. I am not sure what went wrong, as I have not encountered a sunken cake even though my oven is not reliable. I do have problem with chiffon cake sinking before the baking time is up as my oven temperature is not stable. I guess it could be due to the beating of the eggs with the sugar. You need to make sure that the mixture becomes double/triple the volume and that when you lift up the whisk, the mixture should leave a ribbon-like trail behind. Did you manage to beat till this stage? 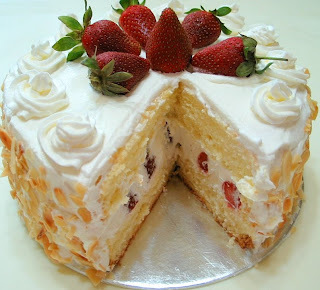 You can take a look at my post "Strawberry Mango Cake" where I have posted some step-by-step photos. Hope it helps. I think i might have overbeaten the eggs, beating for about 7 minutes then another 1 minute on slow speed, but instead of like a ribbon, it was very thick, more like a batter. I guess the speed of my hand held mixer was abit too powerful! I had a second attempt, aiming for the ribbon and the outcome turned out much better, it did not sink, but i hadn't noticed the cake rised much either. I usually bake my cream birthday cakes without any oil or butter as i thought it may be too rich, but having tried adding butter it wasn't as bad as i thought, and held a better shape, as mine usually sink a little if i dont add any oil/butter. Hi Calisiacia, so far I have only tried 3 sponge cake recipes. I have since been using the one for the 18cm cake, posted under the Santa Claus cake post. I have received good feedback from those who have tried it, you may want to take a look at it. Hi happy baker, i have already looked at the methods you've used for your 3 sponge cakes, and very good presentations too! My cake did go quite well, i beat the eggs till it flowed like ribbons, and the sponge came much softer than my usual. The only thing was somehow the cake did not rise as much as the method i usually use, and strangely some of the flour gets trapped in the air bubbles which is noticable when i slice the sponge in half, (but i have already folded the flour in the eggs for quite a while, making sure not to overmix or deflate it. Do you know why the flour gets trapped in the airbubbles? And also, do you know what i can do to get fine and even air bubbles instead of big and small ones all in the sponge? 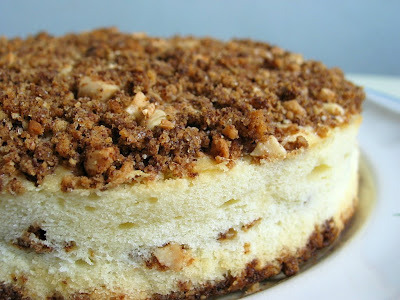 I also added almonds to the side, but what can be done easier is, after applying the cream to the sponge, hold the cake with one hand (making sure there is a base to the cake), then use the other hand and grab a bunch of almonds and gently pat the almonds onto the side. I had toasted my almonds in a pan previously, so while you pat the almonds on, the extras should fall back onto the pan, and then you start the process again, turning the cake slowly as you go along, it helps to slightly tilt the cake so that the extra almonds can fall back into the pan. I use to do the same by trying to throw chocolates and all sorts of decorations on the side, but i think its better to gently pat them on with your palm, leaving less mess in the end. Anyways, thanks for all your advice! I think cakes with the 'separate eggs method' (which, to me is like making a chiffon cake), will rise higher than the whole egg method. For the whole egg method, during baking, it will rise above the rim of the cake pan, when the baking time is almost up, it will sink, to around the same level of the rim. As for the air bubbles, when the batter it almost ribbon like, you should lower the speed, this will help to stablise the air bubbles, so that the bigger bubbles will disappear. So far I have not encountered flour being trapped in the air bubbles. Hmmm, not sure whether is it due to the sieving of the flour? I always sieve the flour 3 times whenever I make a sponge cake. hi happy homebaker, i am a new visitor to your blog and absolutely love the pics! i have been wanting to make a light moist layer cake but can't seem to find a good recipe. ur recipe seems great but i am amazed by the lack of any raising agent, like baking powder or soda! is the rising of the cake only by the beaten eggs? is using cake flour necessary? many thanks. Hi Jessie, when you mention 'creaming' are you referring to frosting the cake with whipped cream? I am not good at it at all! I simply spread the cream and try to smoothen it all over. You may want to check this site (http://www.baking911.com/decorating/cakes_frostandfill.htm) on tips to decorate a cake. If you do a google, I am sure you can find video clips to demonstrate how to go about it. hey~ sorry im back again to ask another question! LOL umm..will it be ok if i used a 9" cake tin for this? will the cake turn any different?? and do u reccomend any ways of transporting this cake...like actually taking it from the house on a train etc etc..without ruining the cake? >< sorry for all these stupid questions! but i really want this cake to be perfect! Hi Jessie, if you were to use a 9" pan, you will have a much 'shorter" cake, and you will have to take note of the baking time, as most of the time, cake takes longer to bake in a bigger pan, however, I have not tried using a bigger pan to bake this, so it really depends on your oven, it could also take a shorter time to bake. Sorry, I am of not much here. As for transportting, place your cake on a cake board, if you cake is 8", you get a 8" cake board, and get an 8" cake box. The board will fit nicely in the box and won't move about. Both items are available at this partyware shop by the name of "SKP" (http://www.partyware.com.sg/index.htm) which is good as they sell in loose packs. Hi Shemin, I'm sorry, I'm not too sure what causes your cake to be crumbly. If the texture is right, you should be able to slice it horizontally. thanks. i whisked the cream to soft peaks so probably need to whisk a little longer. how long does it take u to beat the cream to be stiff? i'll put parchment paper next time so that it is easier to take the cake out. and dare to cut it too!! Hi Shemin, I used non-dairy whipping cream, it takes only about 2~3mins. Just make sure your mixing bowl and the cream is very cold, it helps to speed things up. You have to line the pan with parchment paper to unmold the cake easily. one more question....will it be ok for me to frost the cake the night before with whipping cream before i take it to my bf's house the next day? Im sacred the cream might 'melt'? and the cream will be liquid the next day?!?? Hi Jessie, don't worry, you can frost the cake the night before...it will not turn into liquid or 'melt away' in the fridge. Even when you are 'transporting' the cake, the cream won't melt away. By the way, to keep the sponge layer moist, you should brush the layers with syrup water (refer to the comments on my post on Santa Claus cake). As for making the sponge cake, you can refer to the video on making swiss roll which I posted recently. The method is almost the same...the only difference is the baking pan and the baking time. I'm feeling excited for you! You know what, when I first made a birthday cake for someone close, my hands were actually trembling when I was frosting the cake. The anxiety of making sure everything went well is something I will always remember. it tasted great and it got to my bfs house in one piece, thanks HHb for all the help..now i am way more confident in making bday cakes..with whipped cream! I noticed in this recipe, you used 206g caster sugar! But in your Peach Layered Sponge Cake (Happy Pa Pa's Day ), the caster sugar called for 100g only. However, all other sponge cake ingredients remains... errr.. can I ask, should it be 206g or 100g? Hi Anonymous, for this recipe, the original recipe calls for 206g caster sugar, but I find it too sweet. So under the Peach Layered Sponge Cake, I mentioned that I have cut the sugar by half, that is why for that cake I used only 100g of sugar. If you want a sweeter cake, you can go for 206g, if not 100g works fine too. However, if you wish to make a smaller cake, I would like to recommend that you try the one that I have posted under Santat Claus Cake, I like that sponge cake recipe. Hope this clears your doubt. Thanks for your reply, I will try the sponge cake you posted under the Santa's. BTW, I tried out the Yogurt Strawberry Cake, but I used blueberry instead. It was really yummy, moist and fluffy :) But the only thing is that I find it a little bit sweet, not sure if it will affect the cake texture if I were to reduce the sugar. What do you think. Hi Anonymous, are the blueberries very sweet? coz those strawberries I used for that yoghurt cake were sour, so I found the sweetness quite alright. If it is not due to the blueberries, you can try cutting the sugar down alittle, but not too much. Sugar has got it's purposes in cake baking, so do try to stick to all baking recipes as closely as possible. 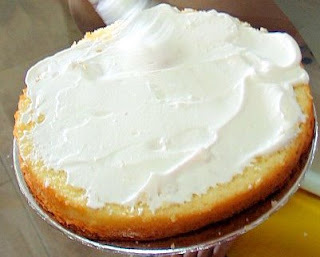 As for making the sponge cake, do check out video clips online to get a feel how to go about it. Do drop by once you have tried it, will love to hear from you, happy baking! Actually, I tried the sponge cake using the Santa recipe. Fail. Think I have over folded the flour, cause I can't get the flour incorporated into the batter, so kept on folding. Tried another attempt - beat the yolk and white seperately. Well, I got a rather soft and fluffy cake, but this is a bit traoublesome compare to your method suggested. Hi Anonymous, did you sieve the flour? I usually sieve the flour 2-3 times, and when I am about to add in the flour to the egg mixture, I will sieve over the flour again. You can add in the flour in 3 separate additions, and fold it with a spatula not a whisk. Keep sliding the spatula right underneath the bottom of the mixture and lift it up, and turn the bowl at the same time. Do take a look at the demo video (link posted under Santa Clause cake posting). I have read that making sponge cake using the whole egg method is actually more difficult than using the separate eggs method, however, I find that the whole egg method is much easier, as I'm always not very sure when to stop beating the egg whites! Hi Happy homebake, yes, I sieved the flour once. May I asked you, after each sieving, the amount of the flour will get lesser, so, if you sieve so many times, is it still ok? since the amount of the flour will not be the same already as what is requested in the recipe. Hi, I'm sorry, I'm quite puzzled...why would the flour get lesser after sieving it? I usually sieve the flour onto a sheet of baking paper, collect the flour and sieve it again. This way, the amount of flour will remain the same. I first weigh the flour according to the recipe. Then seive, there will be some * unseived flour * left on the sieve. I will not force it thru, but throw it away/ put aside. So the amount of the sieved one will not be the same as the original. So, if I continue to do this for a few times, aren't the amount for the balance will get lesser, may be not much, but then will it affect the texture of the cake? I also throw away the remaining flour after the first sieve, the sequence 2nd, 3rd sieve, I will sieve the flour all the way thru as after the first sieving, you will find that the flour becomes very loose and light. I am not concern about the remainding weight, as what I throw away is really little...maybe you can start by sieving a little bit more of flour than required, or maybe after sieving, you may want to weight the flour again just to see that you are not to far off. However, do note that the weight of sieved flour is much lighter than unsieved flour, so always measure out the flour before sieving, unless the recipe specifically calls for measuing sieved flour. Hope I don't confuse you too much! Hi, no, of course not. ok, I will try it out again this weekend. Bought a punnet of the Korean strawberry from Giant - huh:) got Sale..
Wanna congratulate you for such a personable blog. I really love it! Caught my eye on the strawberry sponge cake *so pretty*. Since I had some sponge flour from Phoon Huat, I thought I would give it a try. I am a amateur and my first attempt rose very nicely in the oven and flattened unceremoniously when taken out... haha... my mom had to comfort me to say its ok. Then I realised that Sponge flour has sugar! So i tried a 2nd time within 2hrs. This time, sifting out the sugar as much as I can. The sponge cake looks right but I wanted to check what should the ht be? I baked it in a 7" round tray and my cake was about 2" tall. I have not used any sponge flour, I always use cake flour. I think the sponge flour pre-mix has got other ingredients in it not just flour alone...there could be chemical leavening(baking powder) or emulsifier (to help make the cake very soft and keeps longer). I will like to advise you to use cake flour if you are following this recipe. My 7" cake pan is 3" deep, and most of the time this cake will rise slightly above the rim, so upon cooling it should be around 3" tall. I suspect you may not have beaten the eggs correctly, did you beat till it double/triple in volume and leave behind a ribbon like trail when you lift up the whisk? and when you fold in the flour, you have to be careful not to deflate the batter. I would like to know how I can measure 30g of salad oil and 30g of fresh milk. Is it the same as 30ml? Hi Vivian, it is not exactly 30ml, I use a weighing scale to weight them. Hi, loved how the cake looks! ive tried making the whip cream but failed terribly :( my whip cream didnt turn out white like yours but looks yellow (like seriously yellow). at first the cream got abit stiff and after i whip for a while water started appearing!!! omg. depressing. Is it because i used dairy whipping cream? my mom told me to get dairy bcause its healthier apparently. any tips to fix this? thanks so much for the recipe btw! Hi Kati, You have over whipped the cream, that is why it started to separate. You just need to whip until the cream is stiff and stop. Dairy cream will be slightly yellowish, whereas non-dairy cream is almost pure white. My family doesnt like the taste of whipped dairy cream as we find it too creamy. Hi, Thanks for this. I made this cake the day before and was really anxious because it was my first time making a sponge cake. If only I had read about reducing the sugar in the other post, now the cake stays 1/2 untouched in the fridge. My family couldn't take the sweetness. The cake rose nicely except the supposed bottom "crust" which became sticky, chewy and gummy. So the bottom "crust" stuck to the pan but I was able to get the cake out without much damage. Maybe I didn't oil the baking pan well or the pan used is not a good conductor of heat (I had a failed brownie batch using this particular pan). Anyways, I really appreciate the Asian angle of your blog. Keep it up! Hi Ida Lee, sorry about the undesirable outcome of the cake. Sounds like the bottom of the cake was under bake, maybe you can adjust the rack position next time you were to try this again. Heyy hiie HHB~~! d0 u ever tiink of teaching people baking ? those the u have done? I learned baking from cookbooks only, I have yet to attend a baking class! Heyy HHB agaiin. kekes. ahh .. but uur work iis fantastic already... yesterday evening ii diid uur japanese melon pan.. and iit work very well.. but ii had a very hard tiime kneadiing the doudh as ii have small hands ... BUT the end product is EXCELLENT... myyie next target iis the strawberry shortcake but cud uu tell miie wart the diff between 1&2? The difference between the two strawberry sponge cakes, #1 is for a 20cm cake, and #2 is for a 18cm cake. I prefer the taste and texture of #2, and the smaller size is more suitable for our small family. Hi Sharmaine, you can use dairy whipping cream, I used non-dairy cream as we find dairy ones are too rich for our liking. I have some experience with baking, but truthfully, I'm not used to using "grams" to measure the quantity of each ingredient. Do you have any cup/tablespoon/teaspoon equivalents? (I'd weigh it and save you the trouble, if I had a weighing scale- which unfortunately, I don't). I have tried out your sponge cake recipe but the cake just didnt rise much. And it was not moist at all. When I tried to bake it for 20 min, it was already quite dark on the surface, so I dare not continue for 35 min as what you had recommended. Do you happen to know why? Hi Anonymous, I am not sure what went wrong. There could be several causes. May I ask whether you beat the eggs/sugar till it double/triple in volume, and the batter becomes thick and will leave a ribbon-like trail when you lift up the whisk of your mixer? If yes, then it could be the folding in of the flour. Did you fold in with a spatula? and make sure the batter was not deflated. You may like to take a look at my post under "Santa Claus cake" which has got a link to a demo on how to make a sponge cake. You may also like to take a look at my video clip "Making A Roll Cake" to see whether the above steps are done correctly. If you have done everything accordingly, then maybe it could be due to your oven? Maybe your oven is too hot? Thanks for your quick response. I had followed all your instructions exactly. However,I beat the eggs/sugar in different directions instead of a single direction. I folded in the flour with the spatula in different directions as well. I notice there are sone small bubbles on the surface when I pour the batter into the baking pan. Not sure if these are the reasons for the failure. The cake turned out to be quite hard and dry instead of soft and moist. Oh yes, may I know what do you mean by not deflating the batter too much? I actually pre-heated my oven for 10 min as stated in the oven's manual for baking a sponge cake. Is that too long? Another qn, I used the Bulla thicked cream as the whipped cream as Cold Storage had run out of the stock for the non-dairy one. However, the cream actually melted the moment I spread it on the cake, even though I did it after the cake had cooled down. Then I used Qwip sweetened whipped light cream for the rosettes, but it melted as well after a while. What do you think could be the reason? Did you use 1 packet of non-dairy cream for the whole cake and the rosettes? Hi Anonymous, I don't think the small bubbles is the cause. After folding in the flour, the batter should not deflate too much, meaning the volume that has been created after beating the eggs/sugar should not decrease too much. You should be able to fill the cake pan (8") to about 75% full. After baking, the cake should rise slightly over the rim of the pan. Do you have an oven theremometer, it is best to use one to ensure the oven temperature is accurate. Some ovens tend to be on the hotter, while my oven is on the cooler side. You will need to beat the Bulla cream till it becomes stiff (yet do not overbeat it, otherwise it will separate, and you will have to discard it. Do hop over to this site: www.joyofbaking.com to learn more about whipping cream. I have not tried using Qwip cream, but I have read that it is not suitable to use it for decorating a cake. It can only be used as a topping, it will not be able to hold it's shape for too long. No, I usually use 1 - 1.5 cups of non-dairy cream for decorating the cake and piping. This is much lesser than most recipe, as we don't want to have too much cream on our cake. Hope this helps. I've been looking at your blog literally everyday to make the basic sponge cake, but after numerous tries I'm still not able to get the cake to rise. The problem I noticed was that after I fold in the oil & milk my batter tends to deflate a lot to the point that it becomes super liquidy. Any advice to avoid this? I tried mixing a 1/3 of the batter first with the oil, but once I combine it with the rest of the batter it deflates a lot. Thank you for your recipes! I really enjoy them & hopefully I'll get the sponge cake recipe right. Hope to hear from you soon! Thank You! Hi Anonymous, sorry to hear about your unsuccessful attempts. 1. May I ask whether you beat the eggs and sugar until the batter becomes thick, turn pale and will form a ribbon like trail when the beater is lifted up? You may want to take a look at my video on "Making a Roll Cake" to get what I mean. 2. If the above is done correctly, did you fold in the flour with a spatula? Again, u can refer to the above video on the way to fold in the flour. You can sieve the flour 3 times before adding into the egg batter. You can also add the flour in 3 separate additions, each time sieve the flour over instead of spooning it into the batter. 3. If the folding in of the flour is done correctly, the folding in of the butter shouldnt be a problem. I usually add the butter in one go. To prevernt the butter from sinking too much into the bottom, when adding in the butter, pour it over on your spatula and at the same time move the spatula in a circlular motion so that the butter will flow over the top of the batter. Then fold in gently and yet quickly. The final batter will deflate a bit, but it will still be quite thick, when u pour it into the cake pan, refer to my above video for the consistency. The batter should fill up at least 70-75% of the height the pan, upon baking, the cake should rise just over the rim. Let me know whether this is of any help. Hi HHB! Thank you so much for the detailed advice! I followed each step very carefully especially when I added the butter. The cake came out a lot better & was was edible to eat! Thank you again for your help! I understand that you used the avoset brand for your whipped cream but its no longer available in cold storage. Do you have any other recommendations? I used the bulla thickened cream and whipped till stiff. But it kind of melted abit even before I had finished covering the cake. Also, why is that my cake always turn out to be quite dense and the edge of the cake abit hard, making it difficult to cover the cake with cream? Hi, I have only used avoset brand once. I am now using Phoon Huat's Redman brand of whipping cream (Non dairy). I don't use bulla cream (dairy) to frost a cake as I find it too rich and creamy. It is also not as 'stable' as it tend to melt away wuickly especially in our weather. To avoid this, you can chill the sponge layer so that it is cold, and the cream will not melt away too quickly. If you cake is dense, then maybe it is due to the beating of the eggs and the sugar mixture. You need to make sure it double/triple in volume and the mixture becomes thick, pale and will leave a ribbon-like trail when you lift up the whisk, the trail should stay for a couple of seconds before it disappear. When you fold the flour/butter into the mixture, make sure you dont deflate the batter too much. The final batter should be able to fill up 70-75%R of the cake pan. May I know what kind of baking pan are u using? If you are using those dark nonstick type of pan, it tends to absorb heat faster (I use tin pans), so maybe that's why the edge got over-baked leaving a hard crust. You may want to bake it at a lower temperature. I love your cake! It looks amazing! I was just wondering, if I was to make it just for 2 people, what would the measurements and instructions be? And what size pan would I need to get? My boyfriend loves strawberry sponge cake and it's his 21st Birthday on the 25th of October and I wanted to surprise him with this cake. 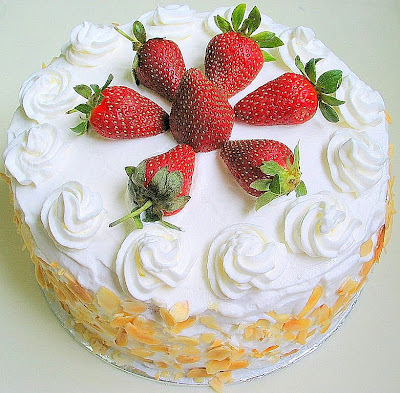 Hi Mich, I have not tried using chiffon cake recipe for a layered cake, but I think you can go ahead as I have seen some bloggers using chiffon cakes in place of the sponge layer. hi, i like ur blog.. sorry for asking such stupid question.. but what does cut side up means? and can i replace salad oil with corn oil? thanks! hi, can i use top flour instead of cake flour? Hi Anonymous, you can use top flour. I dont think it will affect the end result. Yes, you can use corn oil (sometimes I use pure olive oil, or sunflower or canola oil, as long as the oil doesn't have any smell). Cut side up means, eg, when u slice the cake into half horizontally, the sliced part/surface should face up. Hope u get want I mean. so glad that u reply. i just try baking.. but my cake is very low in height. and i think i over cooked a little.. ): but i use plain flour instead. hope its still alright. so do i apply the cream and put on the strawberry on the cut side up or the cut side down? Hi, I think maybe you didn't beat the eggs and sugar batter well, or you could have deflate the batter when folding in the flour, so the cake didnt rise too much. Under step 4 of "Assemble the cake', you place the cut side facing up, and so you apply the cream on cut side up. I am no good at frosting a cake either, it is not easy to make the surface smooth especially if we do not have a cake stand (those that can spin). However, I am sure after a few more practices, you should be able to get the hang of it. thanks for the reply. i will take note. (: but i have another problem now.. sigh.. i am using the false bottom pan and the batter will leak out from it. i tried using alumiminum foil to cover the pan from outside. but i think if affect the result taste of the cake.. what should i do? Hi, I use a removable base pan too, but the batter wont leak, maybe you can check your pan (pour in some water and see whether there is any leaking), the base could be dented causing the leak?? If not you can use a normal pan to bake the cake. i try the method, pouring water to the pan.. it flows out not leak. so headache.. i just bought it a few days ago.. sigh..
Oh, so it is not because of the pan...maybe it is because of the batter, did your final batter became quite thick (see my video on making roll cake, the consistency should be quite thick, the last segment when I spread it onto the baking tray)? or it could be due to the oven temperature? Did you preheat your oven? The cake has to be baked at the right temperature otherwise it will be 'sitting' in the oven waiting for it to reach the required temperature. So maybe that's why it started to leak when the top already started to expand?? should i use cold eggs or room temp eggs for making sponge cake? cos i came across a sponge cake recipe which said to use cold eggs, do u think it makes a difference? For sponge cake,can i just lined the bottom of pan with parcement paper but greased the sides (ie. sides no parchment paper)? thks alot. Going to bake for my child's bday today. Look forward to reading your pineapple jam making blog. I make it recently, but should cook it slightly dry so that it is easier to mould into small balls. Mine was too moist but if you want to spread on bread then it is just nice. Hi May, please use room temperature eggs. In fact I have skipped one step...by right base on the cookbook, the eggs and sugar should be beaten over a bowl of warm water for a few mins. But I always omit this step. It is easier to beat the eggs and sugar till ribbon like stage with room temperature eggs. Do remember to turn down the speed to Low when you reach the ribbon like stage. This will help to stablise or reduce the big air bubbles. Also remember to sieve the flour a few times, it will help when you fold in the flour to the batter. You can line just the bottom of the pan, for the sides, grease it with butter, then dust it with flour (coat it evenly). Knock off any extra flour before using. Let me know which pineapple tart recipe you have tried and whether it is good. The recipe I am using is good for closed type of tarts, for open surface, it is a bit too soft and crumbly. I will need to adjust the recipe a bit. I really like starwberry ..
thanks for sharing the recipe .. I'll try it. whether there are other tips to make them look good as you make? I wish I had taken a photo of my thrown together cake it was halarious!!!!! but my family loved it just the same Thanks for your wonderful blog you encourage someone like me (who doesn't enjoy cooking or baking) to just roll up my sleeves and have fun with it BRAVO!!!!! Now that's a cake that I'd like a piece of, right now!! would like to check if this recipe is "tough" enough to put fondant over? i'm supposed to bake a strawberry princess cake for my daughter for her birthday.. so i would be using e wilton princess mould and put fondant over and put e barbie doll in.. u think this recipe is tough enough to hold? or the japanese strawberry cake? pls help! Hi, I don't think it will be sturdy enough. oh no... do u have any strawberry cake recipes dat is sturdy enough? thanks!! Hi, Sorry, I do not make any fondant frosted cakes, so I have not tried any cakes that are sturdy for it. hello, Sandy here. Can I know how do you sparkle the almond on the side of your cake? Hi Sandy, I hold the cake with one hand, and cover the sides with the almond flakes with the other hand. I place a baking tray below to catch any almond flakes that drop off. Harlo, is me, Sandy again. I saw you said you tilt the cake, the cake wont sliding down? Hi Sandy, no the cake won't slide down as I am holding with one palm and the other hand just cover the sides with the almond flakes. Just tile it a little will do. I want to bake this cake this coming week but im not sure how i should place the strawberries in between the layered cake slices in order to create a nice cake slice pattern when its sliced. Should i place whole strawberries vertically (like how you did), or should i place it lying on the cream? Really need your help and suggestions! Im dying to create a nice pattern when its sliced. Haha! HHB, I knew you have this recipe in your blog but I could not find it until now. I think I must give this a try. Wish me luck ! I always look out for a cake recipe that has the fruity ingredient in it... but when it comes to strawberries it only goes as topping. I wish there was a recipe that incorporated fresh strawberries in the batter. I think I should try it. Would you? Hi HHM, I have tried baking the sponge cake twice but both times, the texture turned out to be quite rough. Is this the way it should be? If not, anything I should take note of? Thank you. Thanks for your advice. I tried it again, got the ribbon like batter and the texture was softer this time but there were crumbs which dropped off easily. Is this anything to do with the temperature and baking time? Thank you. I've been looking at many recipes on strawberry sponge cake and most of them only use the yolk part of the egg, but because your recipe looks the most promising out of them all, I just want to ask: to make this cake, did you use whole eggs or just egg yolks? Hi, I used whole eggs. I want to make a 9' version of this cake, should I make any changes to the way I bake it? Hi, the recipe is meant for 8" pan size, 9" will be too big, the resulting sponge cake will be too short. Hi Happy Homebaker! Where can we find salad oil in Singapore? Or can it be replaced by something else? Hi Jojo Lee, you can use other vegetable oil such as canola oil or sunflower oil. I bought topping cream from PH, as I have left over, I kept in glass jar and freeze it. So , do I defrost it in fridge or room temp the next time I want to use it? And how will it take to defrost ( as I need to plan my time ). Sorry to trouble you, thanks. Hi Goody Egg, you can take it out from the freezer and leave it to thaw in the fridge over night. u can use it the next day. do not thaw in room temp. Hi, may i know what kind of whipping should i use? those kind that are watery or those in a can? Hi, not those in a can. I used non dairy whipping cream from phoon huat or this brand 'Pour N Whip' from cold storage.